These Pizza Roll Ups are so popular with the kids. They make a great after school snack. Make up the rolls and keep in the refrigerator so they will be on hand when those hungry kids come home from school. Mix all the ingredients except the tortillas and cheese. 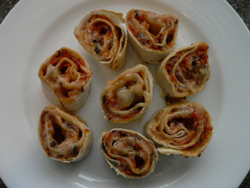 Spread thin layer of mixture on tortilla, sprinkle with cheese and roll up. Wrap in cling plastic for at least an hour. Cut into 1 inch slices, place on cookie sheet standing on tortilla side not laying flat, bake at 375°F for 5-8 minutes. Time saver! : Make roll ups in advance and just slice and bake as needed. Line your cookie sheet with foil or parchment paper for quick easy clean up.